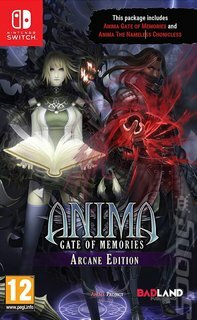 Anima: Gate of Memories is the indie action RPG from Anima Project Studio. The plot of Gate of Memories centres on a nameless woman known only as The Bearer. Perhaps not the greatest decision-maker, she made a pact with an evil entity locked in a magic book while doing work for her organisation, known as The Church. She finds herself trapped in a magical tower, cut off from her own dimension and everything she's ever known, and must fight the hordes of evil nasties that populate it so she can prevent a world-ending prophecy from coming to pass. RPG fans who like a deep backstory and a lot of lore built into their worlds are going to be in their element with Anima. This is an action RPG through and through, with gameplay built out of the familiar pillars of combat, exploration and platforming. There's a liberal serving of epic boss fights, and once you get into them the game starts to feel like Devil May Cry or Bayonetta - you can't expect to just run in and start mashing buttons. You have special attacks at your disposal, but they have power gauges and you'll need to be strategic about when to deploy them. Timing is everything, and the dodge mechanic is all-important. In between fights you'll get the chance to level up your characters, earning new abilities as you climb the skill tree and (hopefully) powering yourself up enough to save the world! It all runs at a smooth 60 frames per second and an atmospheric (and at times intense) score really soups up the presentation. Fans of gothic RPG action like Devil May Cry and Castlevania are going to want to pay attention to this one.